Home / Columnists/ Sri Lankan consumer in trouble? When Sri Lanka voted in a new government in January 2015, none of us in the private sector thought that we will be faced with today’s tough reality after three years. Whilst many of us are yet positive and optimistic, we must also be practical and see the reality. 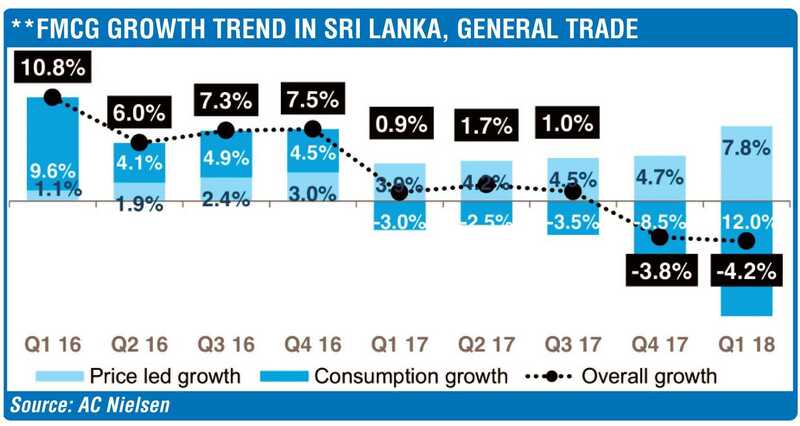 If we take the 3.1% GDP growth experienced in 2017 at the macro end, we see that at the household end we see how the Sri Lankan consumer is in trouble as per AC Nielsen research report with the home consumption contracting by 3.9% in Q1, 2.5% in Q2, 4.5% in Q3, and in the final quarter by 8.5% in 2017. This means that the macro picture mirrors to the reality at the household end. In my view, the feedback received on 10 December 2017 at the local government polls was not a political brand switch but a vibe to the political hierarchy that the performance in the three years was not right. However, sadly we see that nothing has changed on the way the country is been governed as the Q1,2018 data from AC Nielsen reveal that consumption has further contracted by 12% with almost 7.8% been price led. This means that the fuel price increase will have a future hit on the consumer disposable income and hence the Government will be further challenged. In the backdrop of this consumer reality unfolding, it was sad to see the Central Bank issuing a statement stating positivism towards Sri Lanka given the better credit ratings given by two international rating agencies. May be from a country’s economic perspective it may be right, given that the positive foreign sentiments may be somewhat right at a macro end but I am not sure if that is the reality from a Sri Lankan citizen’s perspective. The rupee has been depreciating sharply against the US dollar since the beginning of this year. The weakening of the currency reflects the continuing pressure by the external sector characterised by the wide trade gap and heavy external debt commitments which strictly from an economic sense is not healthy. The rupee is falling by 3.3% against the dollar as at today in 2018. In April alone the rupee has fallen by 1.1% reflecting a sharper depreciation which to my mind is one of the causes for the 7.8% price led consumption growth as per AC Nielsen report for quarter 1 of 2018. The logic being that the basic essentials for a Sri Lankan home like rice, sugar, dhal, sprats are all import dependent. A point to note is that when a currency depreciates it also has an impact on the foreign debt burden. As per the release by Central Bank, depreciation does not cause any rise in the foreign debt stock in US dollar terms but we must note that it will have a direct impact on the servicing costs on the debt stock and disposable income at the consumer end as explained before. If we analyse the currency depreciation as at end April, it will also result in the foreign debt stock increasing by rupees almost 14 billion and I am not sure how the Central Bank can be so upbeat on the state of the economy as in the case of the recent press release. For the records let me stack the debt servicing that Sri Lanka has to meet between 2018-2022. To be specific in value it is around $ 17.8 billion with the 2018 at $2.8 billion, in 2019 it is a staggering $ 4.2 billion, 2020 will be $ 3.3 billion and 2022 is $ 3.7 billion which is said to be the reason why some say that the opposition does not want to come into power until 2020. Given the above argument, we will see that a Sri Lankan consumer will not only be in 2018 but it will in fact increase in 2019 and then it will slowly ease out provided that the country can spruce up the economy. Sadly, we cannot have the confidence from the current administrators of the country that the economy can be spruced up to a level that we can protect the consumer from external shocks. The logic being that research done by the Pathfinder Institute has revealed that in 2017 only 54% of the budget proposals have been actioned for implementation with 8% fulfilled, 22% substantial fulfilment whilst 24% partial fulfilment. This poor performance is the reason why Sri Lanka GDP has grown by 3-4% GDP whilst the South Asian countries are recording a 6-7% GDP. In my view, even if Sri Lanka implements the 1960 Economic Development Plans we can go on to achieve a 6% plus GDP growth. Given that I headed the key policy making body of the Government-NCED for almost three years, what Sri Lanka requires is ‘Basic fundamental economic development initiatives’ and not hybrid and sophisticated agendas. The Pathfinder Institute report went on to state that 11% of the budget proposals of 2017 was not disclosed on the progress achieved, which is unfortunate given that it accounted for Rs. 21.6 billion in value. 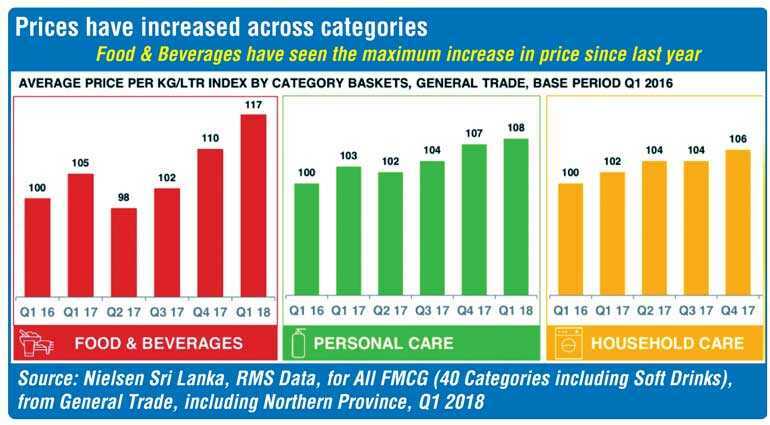 This adds to the lethargy of driving the economy and it will not be good news for the Sri Lankan consumer. Once again going back to empirical research, it states that in a typical island nation the contribution from the tourism sector can be as high as 25% of the GDP. Sri Lanka is at around 5-7% which tells us the opportunity Sri Lanka has to develop this sector and there by contribute to the economy. If Sri Lanka is looking at a quick win for the economy my pick is to aggressively drive the tourism industry given that every time when we bring down a quality tourist it will create four new job opportunities locally. But, the development of an economy cannot be done only by the policy making body which is state driven but, it must be pushed by the private sector so that the industry can be consumer led. Sadly, if I track back to the period 2008-2018, my humble observation is that the aggressiveness of the private sector tourism sector development is not in par with the other sectors in Sri Lanka like Apparel, Tea, Cinnamon, IT/BPO sectors just to name a few. The key initiative required on the development of the tourism industry is to increase the awareness level of Sri Lanka as a tourist destination in the development key markets and thereby make Sri Lanka a top of the mind destination among the potential visitors. Successive governments have tried to address this issue but failed. If I track back in 2010 when the famous global marketing campaign ‘Miracle of Asia’ was totally developed, on the day of the launch it was cancelled. Then in 2015, when the current Government came to power, once again the initiative of the Global Marketing Campaign planned out but just five days before the top seven global advertising agencies were to present the campaign it was cancelled and the board of directors/ Chairman was dissolved. We are now in 2018 and are yet to see the light of day on this activity whilst our competitor destinations like Maldives, Seychelles, Thailand or Malaysia have launched more than 10-12 marketing campaigns in the last 10 years. If I am to highlight how strong private sector led strong public sector initiatives have developed industries. Let me take the apparel industry. In the early ‘80s it was termed mere ‘contract manufacturers’ and some even used to refer to the industry as tailors but thereafter with some strategic thinking by the industry with strong influencing to the policy makers has given leadership globally by making Sri Lanka the fashion apparel of the world for ethically manufactured clothing. This has given teeth to the industry in competing with price savvy merchandise coming in from Cambodia, China and Bangladesh. Today this noble industry is targeting a $ 7.5 billion plus in export revenue by making Sri Lanka an apparel hub in Asia for R&D, technology sharing for fast fashion which is a case study to the world. 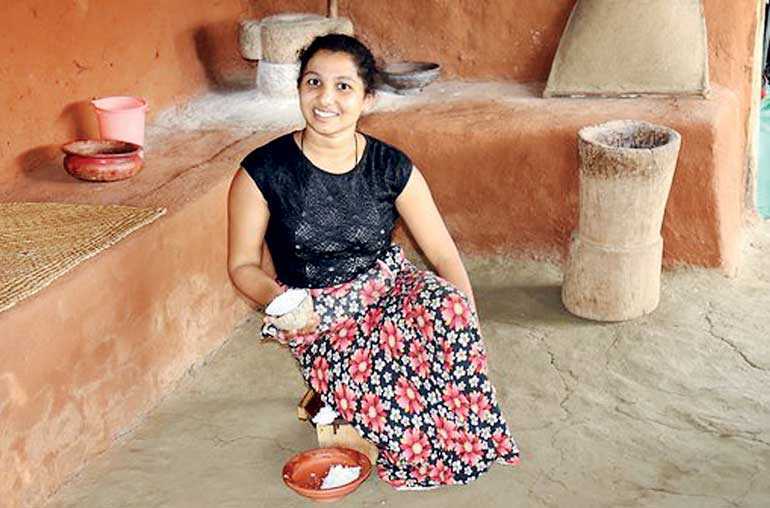 Let me take another industry like tea industry. Once again we see with strong leadership from the private sector and working closely with the state sector has made the industry the ‘first’ ozone friendly certified tea producing nation of the world. Let us also not forget that the current strong position globally, happened due to the key strategic moves in the last 30 years even with all the challenges that the country was up against with the brutal civil war. Starting from the times that the plantation industry was nationalised in the 1970s when it came under Government control it went on in the 1980s to make a bold decision to make the Colombo auction control the global demand chain by breaking away from the great London auction system which has held ground for many years. The Colombo Auction commanding the highest values for tea globally is a testimony that this decision was correct which was a decision taken by the private and public sector. Thereafter in the 1990s the supply chain was privatised to management companies which gave the opportunity for new thinking to be introduced to the industry with strong R&D power and capital infusion that resulted in Sri Lanka demonstrating the best performing country globally for value addition tea at commanding 43% which again was a strong move by the industry. Today , we see that Ceylon tea has taken the high ground with some focused decisions on conforming to global standards on MRL levels and has gone further by developing a new standard for tea that has resulted in Ceylon tea being the first certified ozone friendly tea globally that no other tea producer has received in the industry. This is the kind of leadership and pressure that the private sector needs to exert on the policy makers for things to happen in a bureaucratic country like Sri Lanka. Sadly, we don’t see this behaviour in the tourism sector. Whilst we can identify the problems and agree the possible strategies that can address the burning issues for short term thrust to the economy, the question asked by many is if there is a current political will to do this. From impeachments to shuffling of ministerial responsibilities will not bring in drastic changes unless there is a mechanism set up for evaluating performance. I guess the next 18 months will reveal the truth but as at now the consumer is in trouble for sure.